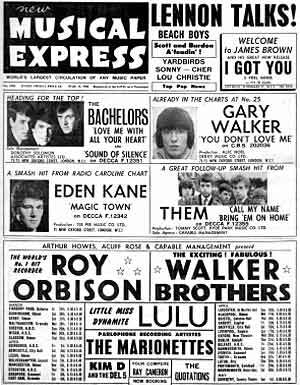 ABOUT THIS INTERVIEW: In March of 1966, John Lennon spoke with The New Musical Express about the reason for the unexpected break from work in their otherwise busy schedules. In what would be a brief but enlightening interview, he also describes his interest in electronic music and tape loops. John shares his expectation that their next album should be very different from the Beatles output to date. The chat took place at 'a nice little caff in Soho,' and was published in the March 11th 1966 edition of NME with the teaser 'LENNON TALKS!' on the front page. Asking the questions was Chris Hutchins. John Lennon and I tried something unusual last week - we went to lunch. Unusual for him because he never lunches out and unusual for me because I normally eat before 3:30 pm. But then journalists have to get up earlier than Beatles do. John arrived (on time) to test the new experience and we moved away in style in the luxury of his Rolls-Royce Phantom V, surveying Mayfair from behind darkened windows that allow you to see out but no one to see in. It's something like traveling in an ambulance, but ambulances are rarely fitted with TV and fridge. The phone in the back of the car hummed: 'Can't be for me,' said John, 'No one's got the number.' We arrived at the restaurant in Regent Street and John sent the car away, asking the driver to return in 90 minutes. Only when it had gone did we discover that the restaurant, where our table was booked for 3:15, closes at 3. ''Ere, it's John Lennon,' said a woman to her friend, but before her friend had turned round we were in the back of a taxi. The driver said he knew a nice little caff in Soho and that sounded better than sandwiches and tea at NEMS (the Epstein Emporium) so off we went. The place was empty and the food smelt good, though sherry in the soup was the closest we could get to alcohol at that time of day, much to the regret of our waiter. John asked for a paper serviette as he'd forgotten a handkerchief and removed his PVC mac ('Bought it in Tahiti for fifteen bob') and the Lennon interview began. Q: "You have often said that you don't want to be playing in a pop group when you reach 30. You are now in your 26th year. The only firm date in the Beatles' 1966 diary seems to be the NME Poll Winners Concert on May 1. Is this therefore the start of the retirement process?" JOHN: "No. We're going to Germany, America and Japan this year. It's an accident that we're not working now. We should have just had two weeks holiday after Christmas and then started on the next film, but it isn't ready and won't be for months. We want to work and we've got plenty to do - writing songs, taping things and so on. Paul and I ought to get down to writing some songs for the new LP next week. I hope he and Jane (Asher) aren't going away or God knows when we'll be ready to record. George thought we'd written them and were all ready. That's why he came dashing back from his honeymoon and we hadn't got a thing ready. We'll have to get started. There's been too much messing 'round. But I feel we've only just finished 'Rubber Soul' and I keep looking for the reviews - then I realize we did it months ago. We're obviously not going to work harder than we want to now, but you get a bit fed up of doing nothing." Q: "Now that you've got all the money you need and plenty of time on your hands, don't you ever get the urge to do something different?" JOHN: "I've had one or two things up my sleeve. I was going to make recordings of some of my poetry, but I'm not high-powered. I just sort of stand there and let things happen to me. I should have finished a new book. It's supposed to be out this month but I've only done one page. I thought why should I break me back getting books out like records? Q: "Do you ever worry that the money you have won't be enough to last your lifetime?" Q: "What sort of people are your guests at home in Weybridge?" JOHN: "We entertain very few. (P.J.) Proby was there one night and George Martin another. I think those are the only two we've specifically said 'Come to dinner' to, and made preparations. Normally I like people to drop 'round on the off chance. It cuts out all that formal entertaining business. We've just had Ivan and Jean down for a weekend - they're old friends from Liverpool, and Pete Shotton. The fellow who runs my supermarket came round on Saturday." Q: "Is the house at Weybridge a permanent home?" JOHN: "No, it's not. I'm dying to move into town but I'm waiting to see how Paul gets on when he goes into his town house. If he gets by alright then I'll sell the place at Weybridge. Probably to some American who'll pay a fortune for it! I was thinking the other night though that it might not be easy to find a buyer. How do you sell somebody a pink, green and purple house? We've had purple velvet put up on the dining room walls. It sets off the old scrubbed table we eat on. Then there's the 'funny' room upstairs. I painted that all colors changing from one to another as I emptied each can of paint. How do you show somebody that when they come to look the place over? And there's the plants in the bath. I suppose I could have a flat in town but I don't want to spend another �20,000 just to have somewhere to stay overnight when I've had too much bevy to drive home." Q: "What kind of TV programs do you watch?" JOHN: "'The Power Game' is my favorite. I love that. And next to it 'Danger Man' and 'The Rat Catchers.' Did you see that episode the other night when that spy, the clever one, shot a nun by mistake? I love that and I was so glad it happened to the clever one." Q: "What's going to come out of the next recording sessions?" JOHN: "Literally anything. Electronic music, jokes... One thing's for sure - the next LP is going to be very different. We wanted to have it so that there was no space between the tracks - just continuous. But they wouldn't wear it. Paul and I are very keen on this electronic music. You make it clinking a couple of glasses together or with bleeps from the radio, then you loop the tape to repeat the noises at intervals. Some people build up whole symphonies from it. It would have been better than the background music we had for the last film. All those silly bands. Never again!"